His Holiness Abba Paulos of Ethiopian Orthodox Church,His Holiness Ignatius Zakka I Iwas of Syriac Orthodox Church, His Holiness Pope Shenouda III of Coptic Orthodox Church, His Holiness Catholicos Aram I of the Armenian Church-Holy See of Cilicia. 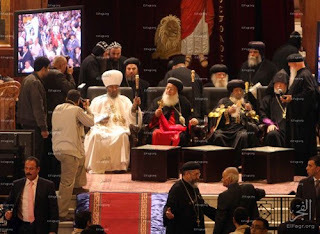 Photo is taken on the occasion of the 40th Anniversary of the enthronement of His Holiness Pope Shenouda III as the 117th Pope of Alexandria and Patriarch of the Holy and Apostolic See of St. Mark on 14 November 2011. His Holiness Karekin II Supreme Catholicos of all Armenians, His Beatitude Catholicos Baselios Thomas I Maphrian of the Syriac Orthodox Church could not attend the function due to other engagements.As His Holiness Abune Antonios of Eritrean Orthodox Tewahedo Church is under house arrest by Eritrean government since 2007 also could not attend the function.